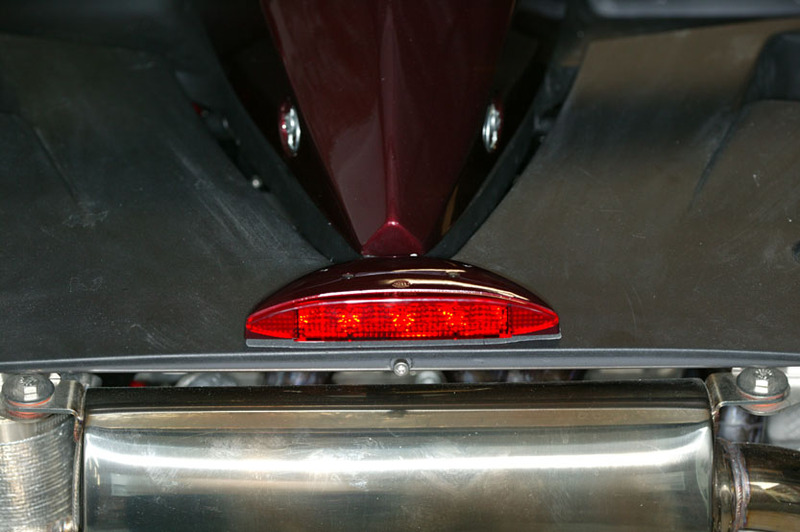 The following DIY documents my 3rd brake light installation procedure for the US Ariel Atom. 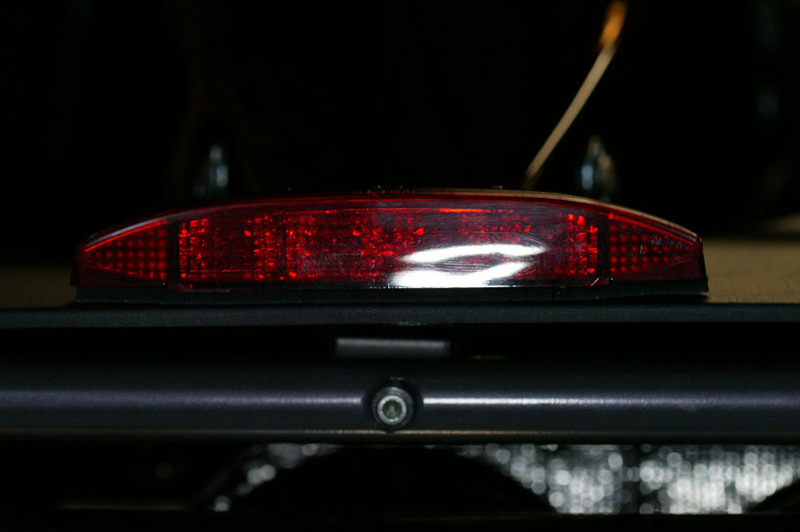 Now that that's out of the way, installing a 3rd brake light (or CHMSL - Center High Mount Stop Lamp - in technical terms) isn't complicated and may help you pass an inspection at your DMV, as well as possibly preventing stops on the road for not having one. Additionally, a NHTSA study shows benefits from the CHMSL. This is the brake light kit I used. It is a Hella model "2DA 007 541-001" and the Hella catalog page can be found here. A convenient US source for this lamp can be found here (part number HL23102). I also used some Thermo-Shield heat protective tape to protect the wires (this is the same heat tape that Brammo uses). This is a picture of the light as installed on my Atom. While it is hard to discern in this picture, the housing is painted the same color as my Atom body panels. The Hella kit includes detailed instructions for your paint shop when painting the housing. The factory finish is a glossy gray color, so you'll probably want to paint it, either the color of your body panels or black. Installation is straightforward, involving drilling one hole in the "tea tray". 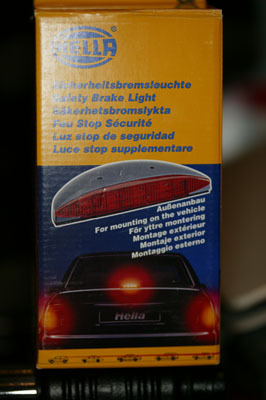 Complete instructions are provided with the light kit. My tea tray isn't really this filthy - honest! It is just the angle of the picture and the bright flash I used. This is the view that people behind you will see. 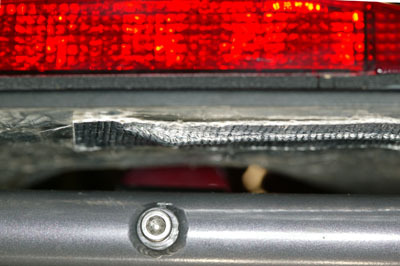 I have covered the wire with heat insulating tape to protect it from the heat of the muffler, which is right below it. Extend the tape to the diagonal tube member on the right side of the car. Since the light is attached to the "tea tray" which tends to be removed for various maintenance purposes, I installed a mating pair of 2-pin GM "Weather Pack" connectors. These are the same style used elsewhere on the Atom, and are available from a large number of vendors. Of course, you can use whatever connectors you like. Route the free end of the cable down the diagonal tube member to near the right rear tail light assembly. Use a tie wrap at the top and bottom of the tube to support the cable. 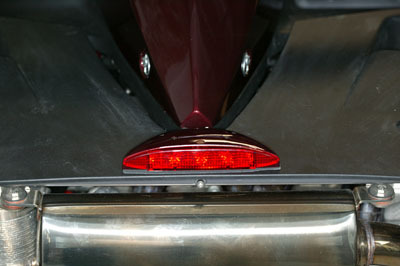 Now, you need to get into the tail light harness to tap power for the new light. I disconnected the 4-pin connector by removing the red latch pin and pulling the connector halves apart. I then unwrapped the electrical tape protecting the wires coming out of the tail light housing and slid the woven loom up the cable to give me some room to work. 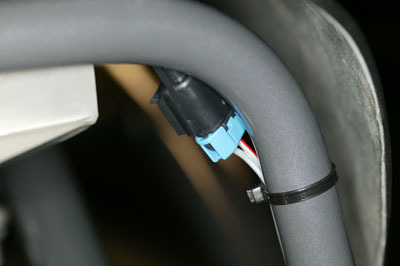 I then used the quick-connect fasteners that came with the light kit to tap into the black wire (ground) and the green wire (brake light). I staggered the two quick-connect fasteners so that when I was done, I could slide the woven loom over the fasteners. I then replaced the electrical tape on the end of the loom and re-connected the connectors and installed the locking tab. Accessibility Policy This page last modified on Tuesday, 02-Jul-2013 07:38:11 EDT. So, what's a glaver anyway? 12 hits this week, 9606 since 4/24/2007.